Days before a series of phone calls in late-2016 between Michael Flynn and Russia’s then-ambassador to the United States, members of the presidential transition team began inquiring about ways to encrypt Flynn’s conversations, discussing with the director of national intelligence’s office by email a range of technologies that would enable secure communications. Among the recommendations apparently approved of by the General Services Administration (GSA)—the agency charged with overseeing the orderly transfer of power after a new president is elected—was the use of Signal, a popular encrypted messaging app that allows users to exchange messages that can self-destruct. These internal conversations, made public under the Freedom of Information Act (FOIA), add further context to internal deliberations of the Trump transition team ahead of moments that have become touchstones of the ongoing Department of Justice (DOJ) investigation into Russia’s 2016 election interference. The emails also suggest that, while certain correspondence may have been recently acquired by the DOJ’s special counsel’s office, other potential sensitive conversations pertaining to Flynn’s communication with Russian officials may be forever unobtainable. Flynn, who served as President Donald Trump’s national security advisor for less than a month and resigned after it was revealed he had misled Vice President Mike Pence and others in the White House about his conversations with the Russian ambassador, pleaded guilty this month to lying to the FBI. Flynn phoned then-Russian ambassador, Sergey Kislyak, multiple times on December 29th in an effort to undermine American sanctions against Russia imposed by the Obama administration in response to cyberattacks during the election, according to a plea agreement. 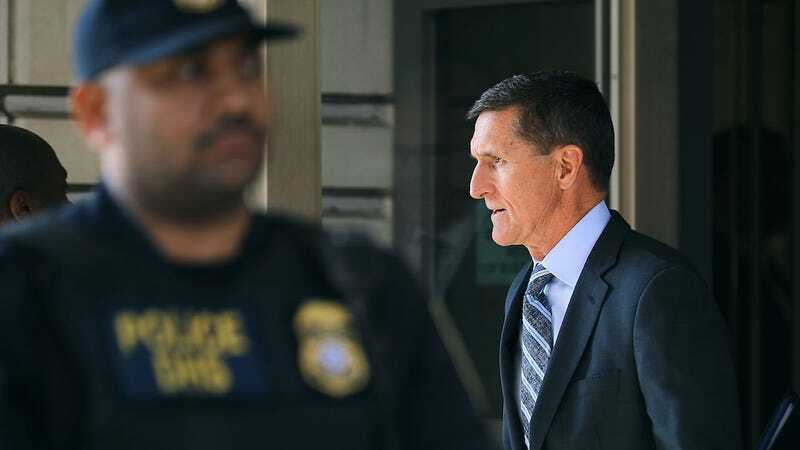 Obtained from the GSA under FOIA by American Oversight, a nonpartisan watchdog group, Trump transition emails reviewed by Gizmodo show that, by the end of November 2016, Flynn had yet to acquire a cellphone that could legally accommodate Secret and Top Secret conversations. However, a variety of services were under consideration: Staff at the Defense Information Systems Agency (DISA), the White House director of technology, as well as a Pentagon project manager overseeing Top Secret data, voice, and video communications, were among those consulted. “Our IT lead has confirmed that we can install an App on the [Presidential Transition Team] phones called Signal. This will provide secure voice and text,” a GSA employee wrote on November 28th. At one point, the GSA asked Verizon to provide a secure phone, but the company said it could not accommodate the request. The transition team was also advised that the Pentagon could supply DMCC mobile devices—smartphones approved by the National Security Agency that allow for Secret-level communications—at a cost of $800 per phone plus a recurring monthly fee of $164.30. It’s unclear from the emails whether Flynn or other transition team members adopted Signal, which would have allowed them to exchange encrypted text messages that can be set to delete automatically after a predetermined period of time—down to a few seconds, if necessary. Regardless, according to National Archives Records Management, presidential transition team records are considered private records. While emails between members of the transition team may be personal, each of the emails reviewed by Gizmodo were either copied or directly sent to other federal employees who are not covered under the Presidential Transition Act, and are thus subject to FOIA requirements. A day after the Trump transition team discussed the use of Signal, Flynn attended a secret meeting at Trump Tower with Kislyak and Jared Kushner, Trump’s son-in-law and advisor, first disclosed by the White House in March. According to the Post, Kislyak later reported to his superiors in Moscow that Kushner discussed establishing a “secret and secure” communications channel between the Trump transition team and the Kremlin. The secret channel was never set up, according to reports. The use of Signal by government employees would become controversial in the months following the exchange, as reports surfaced that staff at the Environmental Protection Agency, Labor Department, and within the Foreign Service had used the messaging app to express concerns about the new administration among colleagues and with members of the press.